Hey everyone! 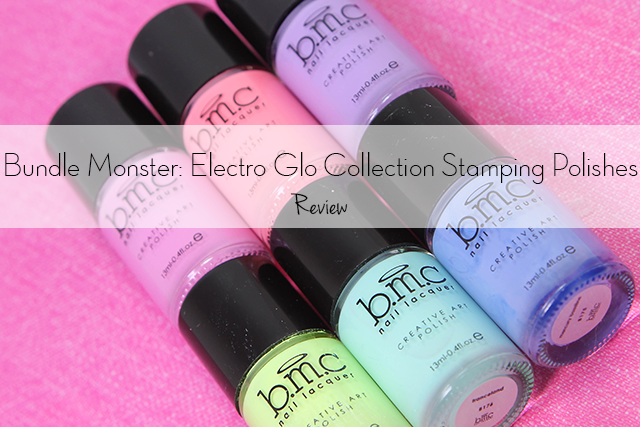 For today's post I have some amazing stamping polishes from Bundle Monster the Weekend Warrior Set. I for one have a hard time finding the perfect stamping polish or polishes that actually stamp. Probably one the most frustrating things about stamping. So I was really excited to see a lot of upcoming polishes that can stamp and/or regular polishes. Before I begin, I want to apologize for not posting as often. Things have been very hectic for the past few months with technical and family issues that needed my attention. Not only I returned back to school, so some of my nail and product reviews were delayed for quite some time. However, now things are official settled and hopefully I will be able to get back on track. Mercury Bassline- is a pastel blue creme polish. This color is one of my top faves and the formula is pretty good. Not thick and a perfect one coater. Below is stamped over a black/white base and applied one coat, sealed with top coat. Kandi Spirit- is a pastel pink polish. This color is one of my top faves and the formula is pretty good. Not thick and a perfect one coater. Below is stamped over a black/white base and applied one coat, sealed with top coat. Rave Babe- is a gorgeous pastel coral polish. The formula is pretty good and stamps amazingly with a clean image. Definitely a perfect one coater. Below is stamped over a black/white base and applied one coat, sealed with top coat. Traceland- is a pastel light blue creme polish and a favorite of mine. The formula is pretty good and stamps amazingly with a clean image. Slightly on the thick side and a perfect one coater. Below is stamped over a black/white base and applied one coat, sealed with top coat. Jungle Mirage- is a pastel green creme stamping polish. This is definitely a bright shade and perfect for those warm weather nail designs. The formula is pretty good and stamps amazingly with a clean image. Slightly on the thick side and a perfect one coater. 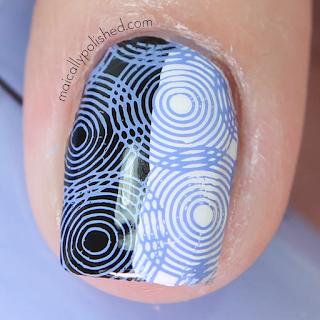 Below is stamped over a black/white base and applied one coat, sealed with top coat. Monarch Dream- is a really pretty pastel purple creme stamping polish. This is one shade I see myself using for this summer. The formula is pretty good. Is a little on the thick side, but a perfect one coater. Below is stamped over a black/white base and applied one coat, sealed with top coat. Overall the polishes are all beautiful and amazing to work with. I can honestly say I'm overly obsessed with their stamping polishes. Every polishes were just perfect and stamped nice and crisp. I would definitely recommend these to everyone! Each are sold separately for $4.99 each and/or you can purchase the set at BundleMonster.com now on sale for $19.99.